If you are not aware of the importance of confidential shredding your paper documents, you should visit onsite shredding Ireland to find out more information. If you do shred your paper documents that have reached the end of their life, then you are already aware of the importance in protecting the private information produced within your business relating to employees and customers. One point that may not be well known by all is that there are huge advantages when outsourcing you confidential shredding to a local and/or national confidential paper shredding service vendor. If you are in a situation where your confidential shredding requirements are going to take up a whole evening, a whole week or possibly being left on the long finger due to the nature of the daunting task then you have a strong indicator that outsourcing your confidential shredding requirements to a professional shredding service vendor will benefit your business and the bottom-line of your business. A mobile on-site paper shredding service company that comes to your business saves you the time from a transportation point of view in addition to a risk management point of view. A professional and trained document security technician will be able to securely shred all your documents within minutes using state-of-the art shredding equipment through their confidential paper shredding service Ireland. When shredding in-house there is little to no accountability and the given Organisation are unable to prove compliance with Legislation when in an audit situation. When you outsource your confidential shredding you are placing accountability on the professionals who are specifically trained to provide compliant confidential shredding services Ireland. This adds to the security of you document management system which in turn will certify destruction of the data. It is important that your confidential shredding service vendor is a data processing firm and not a general recycling firm as the Data Protection Legislation directly applies to the data processing firm and general recycling firms may cause issues in accountability. The technology utilised by professional confidential shredding Ireland vendors are far more secure than your average office shredder and have the capability to destroy high volumes of material inclusive of folders, staples, boxes and more. Within the legislation there are specific requirements for the storage of the material awaiting destruction. If material is left in an unsecure area, in unsecure bins and with unlimited people accessing it you are in turn in breach of your data protection obligations. 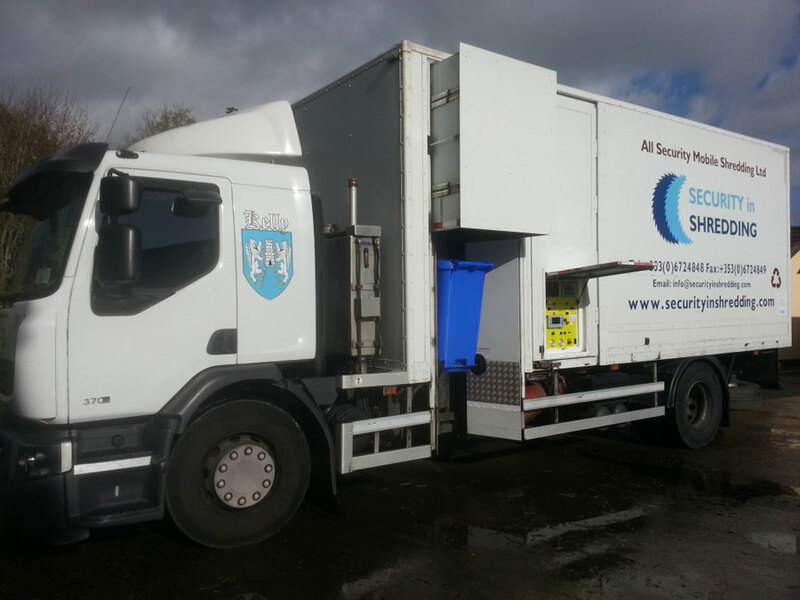 These professional confidential shredding service vendors will provide you with these secure bins as part of the service with no need for the client to make the investment into the storage capacity again ensuring compliance with the law. In line with The European Waste Hierarchy all material that is destroyed through a complaint and professional confidential paper shredding service vendor is recycled where possible and will return to Ireland as egg cartons and cardboard. The secure destruction of 1 ton of paper whether it be through an onsite paper shredding service and/or an offsite paper shredding service will save the equivalent of 17 fully grown trees. Let’s continue with the great work. This entry was posted in Confidential Shredding, Corporate Social Responsibility by Security in Shredding. Bookmark the permalink.